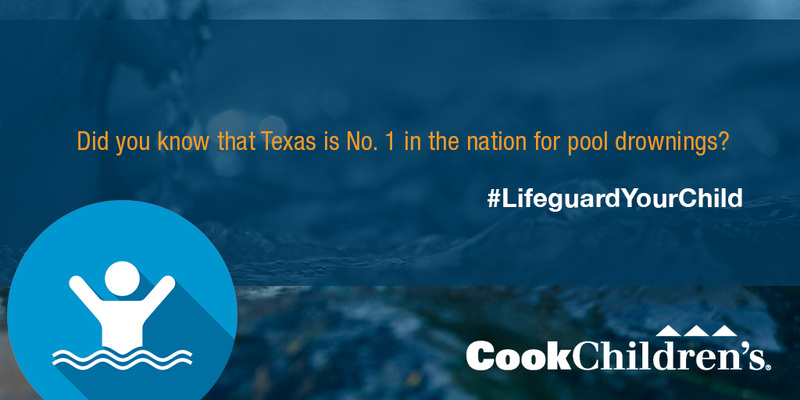 It's time to make Texas #1 in drowning prevention. 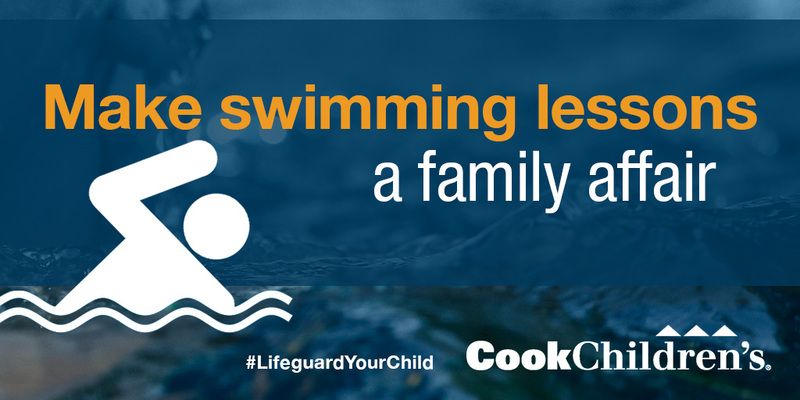 Drowning is the leading cause of accidental death for children ages 1 to 4, and the second leading cause for kids 1-14 in Texas. But with your help, we can change that. Please join us in our drowning prevention effort. 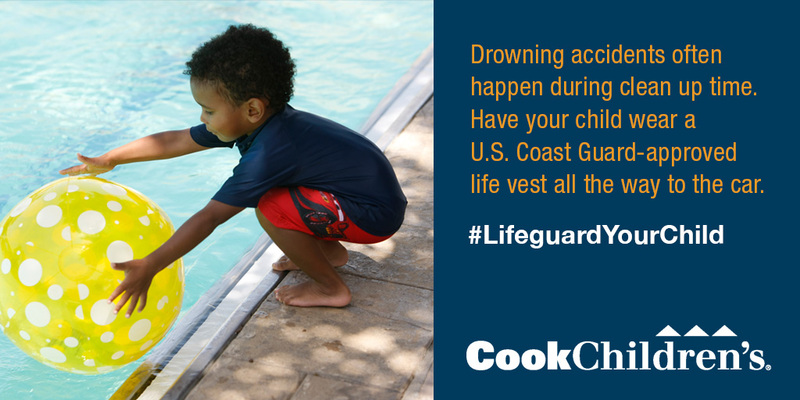 Together, we can Lifeguard Your Child around water. Want to know how you can get involved or create an awareness campaign in your community? Contact Dana Walraven, Safe Kids Tarrant County coordinator at 682-885-1619 or email safe.kids@cookchildrens.org. We put layers of sunscreen on our kids to protect them and prevent sunburns, but did you know that there are also layers of protection to help prevent drowning? 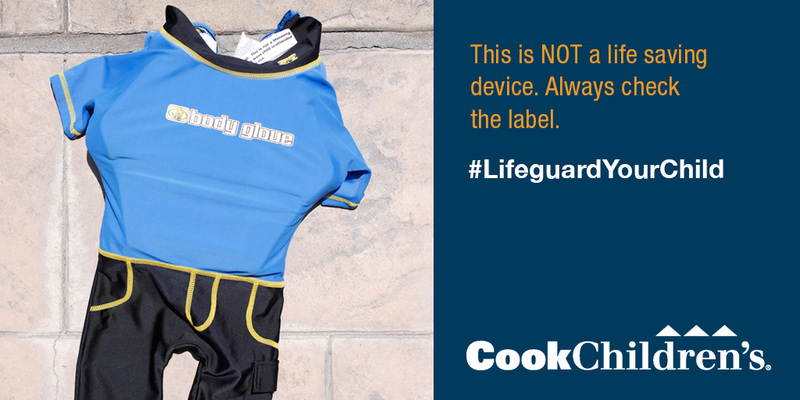 Learn about the layers of protection so that you can Lifeguard Your Child. Install four-sided fences with self-latching gates. 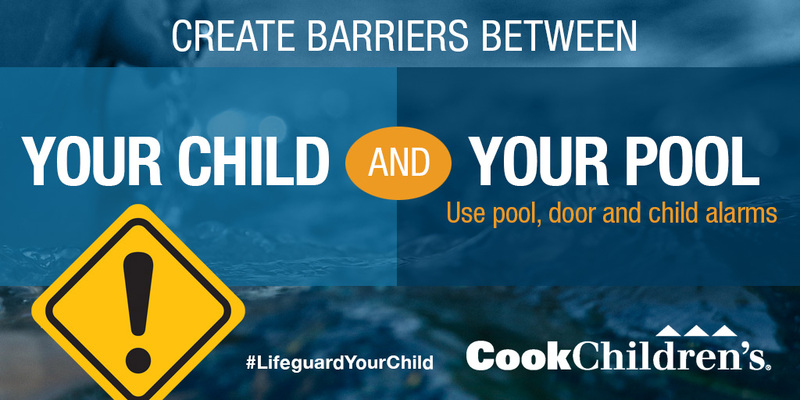 Four-sided isolation fencing around home pools could prevent 50 percent to 90 percent of childhood drownings and near-drowning incidents. The fence should be at least 4 feet (preferably 5 feet) high with a self-closing/self-latching gate that only opens out. Reroute any doggie doors that have direct access to the pool area too. Latches should be properly locked whenever you are not using the area. 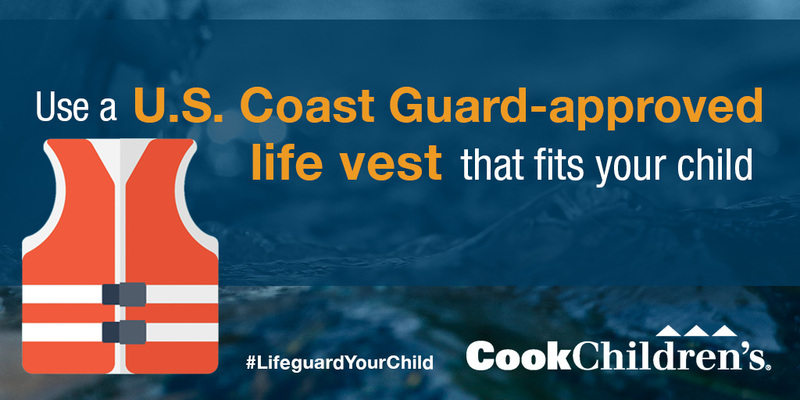 Wear life vests with U.S. Coast Guard-approved labels. As your child grows, the lifejacket needs to meet their new weight. 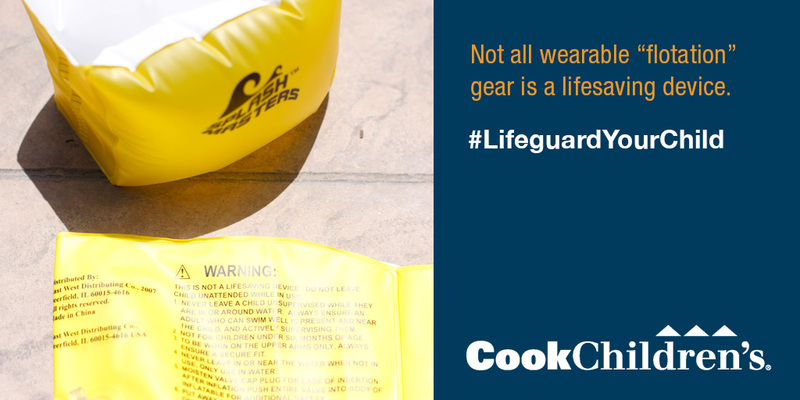 Get a new lifejacket if there are rips and tears or fraying of the straps. Look for the words "U.S. Coast Guard Approved" or "USCG Approved on the jacket." Any items filled with air (arm floaties, rafts, etc.) are considered toys and not a life saving device. Learning CPR can be the difference between life and death while waiting for emergency personnel to arrive. Check your local Red Cross and YMCA for classes. Create and follow all pool rules. Read all informational signs presented at the pool. Listen to lifeguards while attending public pools. Assign a non-distracted adult watcher to focus on children in the pool. 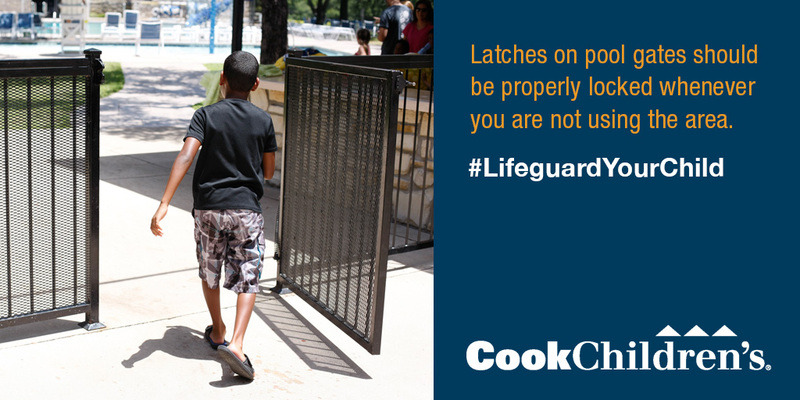 Door and window alarms can give you the valuable seconds needed to keep your children from getting outside to the pool. 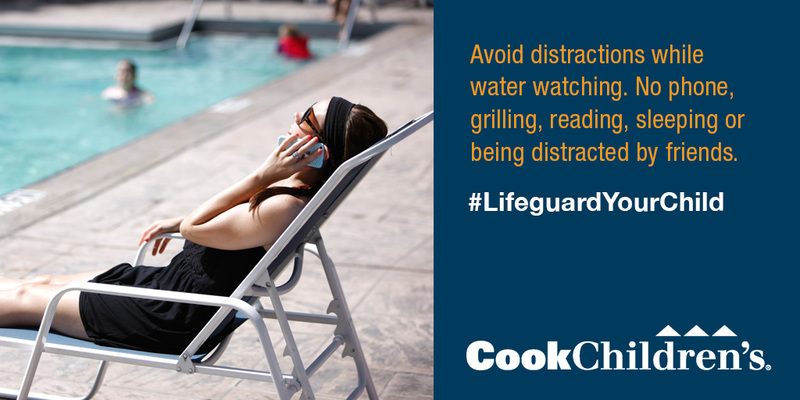 Make sure to alarm any windows and doors that open directly into the pool area. Pool surface alarms are also a great option to alert you if anyone/anything falls into the pool. 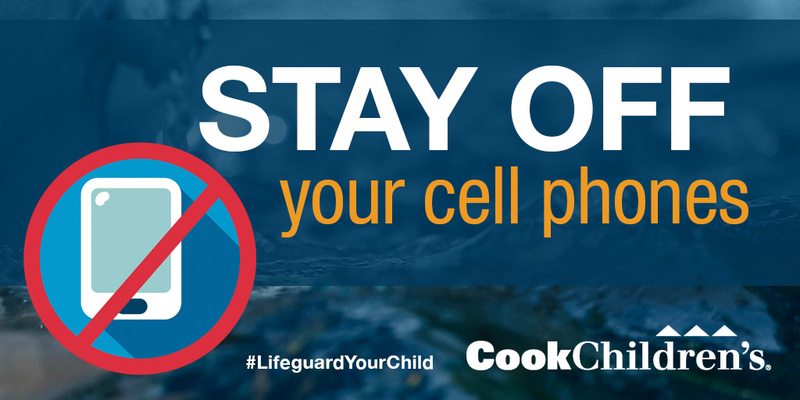 You can even put an alarm on your child that will alert you if they are submersed. Insist on adult, non-distracted Water Watchers. 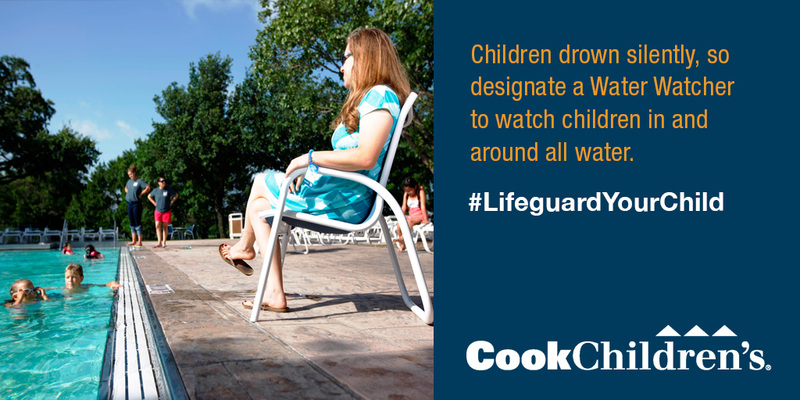 Children drown silently, so designate a Water Watcher to watch children in and around all water. A Water Watcher Tag is used to designate responsible adults to watch the water when you have a party at the pool, lake or beach. At social gatherings, 10-15 minute shifts are recommended for Water Watchers. During that time, Water Watchers should not be distracted by conversations, cell phones, reading, etc. 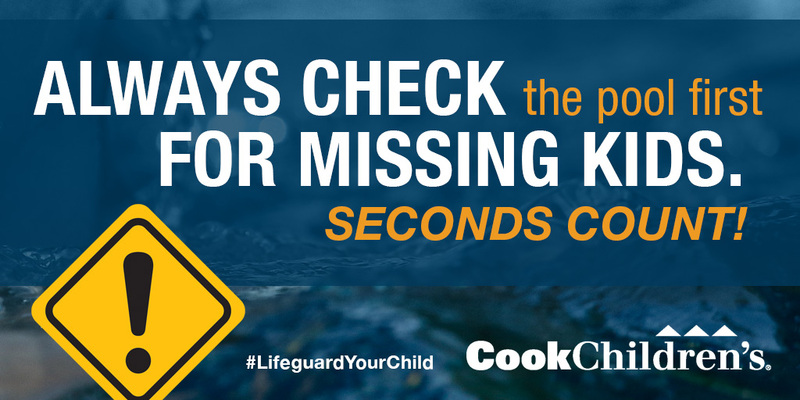 Always check the pool first for missing kids ... seconds count! Send an email to dana.walraven@cookchildrens.org to request your Water Watcher tags. Schedule water safety and swim lessons. Drownings and near drownings are 8 times more likely to happen to children that don't know how to swim or are being supervised by adults that don't know how to swim. 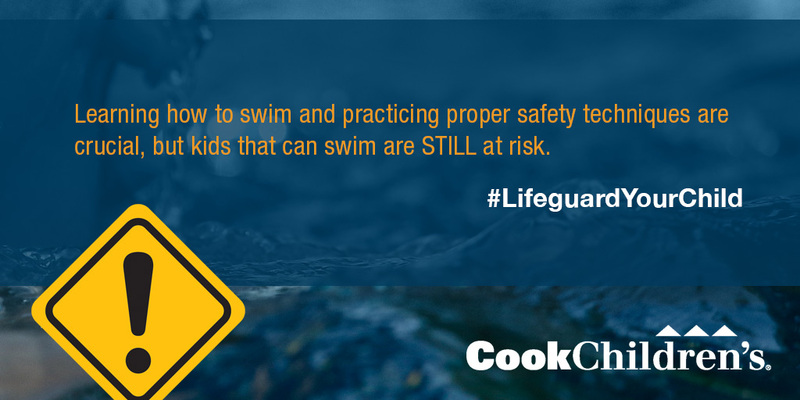 Learning how to swim and practicing proper water safety techniques are crucial but children that know how to swim are still at risk. Need help finding swim lessons? Check out this list of providers in the Tarrant County area. If you're not in Tarrant County, you may want to contact your local YMCA, Red Cross, or parks and recreation center for information in your area. 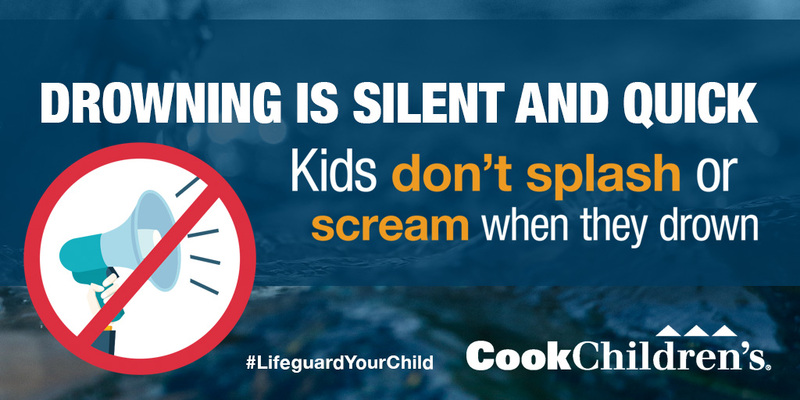 Now that you know all the ways to protect kids from drowning, won’t you help us spread the message? Together, we can help prevent another child from drowning. Please feel free to use our messaging or create your own. To use our messaging, all you have to do is copy the messages we've provided below and insert the appropriate photo into whichever social media site you prefer to use. 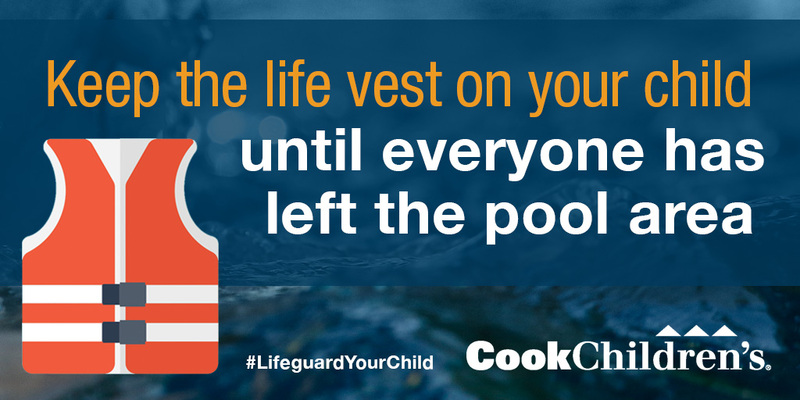 We do ask that you keep #LifeguardYourChild in the message. A special thank you to all of our partner cities and the organizations working with us on drowning prevention efforts. 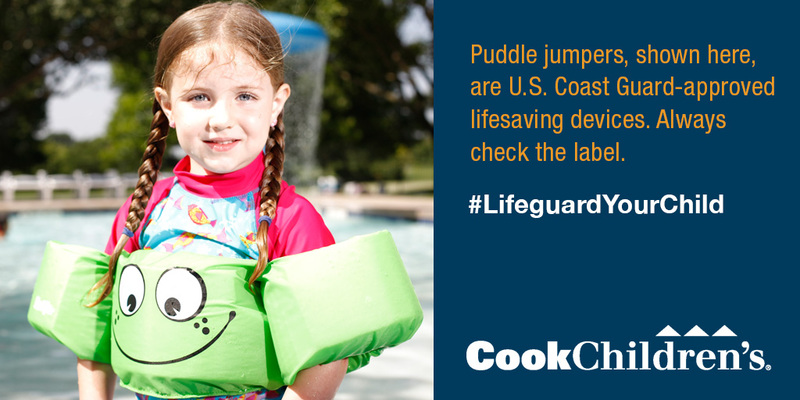 We are so grateful for the support of your communities in this year's Lifeguard Your Child campaign. 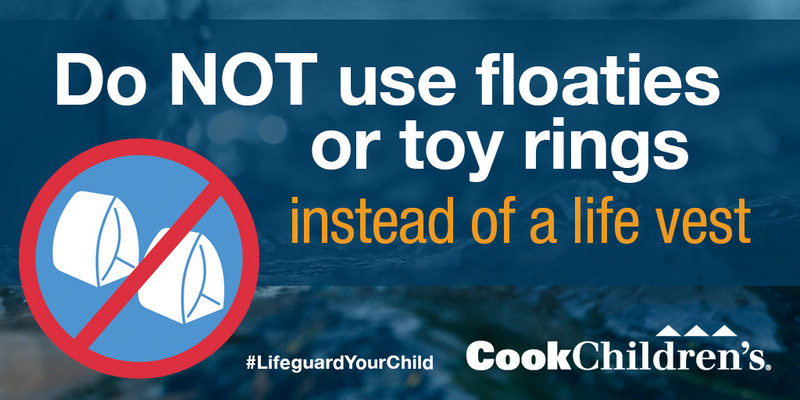 For more information on our drowning prevention efforts in the community, please contact Dana Walraven, Safe Kids Tarrant County coordinator at 682-885-1619 or email safe.kids@cookchildrens.org.